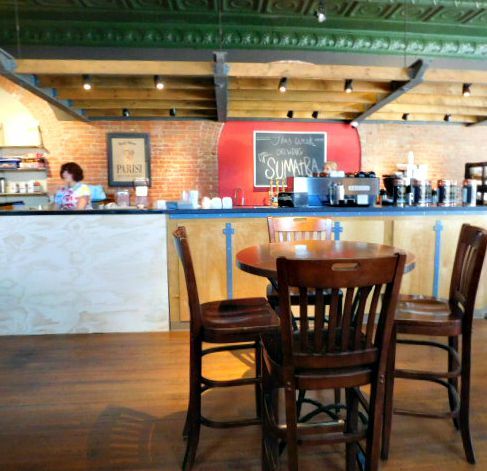 I’ve wanted to explore Groundhouse Coffee in Gardner, KS, for a while now. The former Masonic temple on the corner of Main and Elm Streets gives off a cool urban vibe in the middle of the old downtown. I’m usually in a hurry when I drive through Gardner, but last week I finally had an excuse to stop and check the place out. My mom and I, hot and thirsty after hunting sunflowers, needed cool drinks to revive us. The excellent iced tea at Groundhouse did the job. 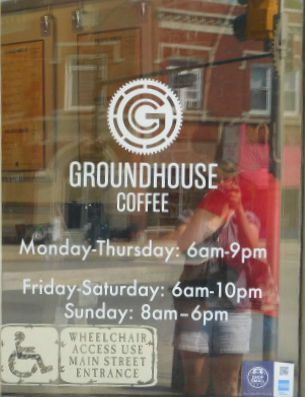 The tea impressed me, because the Groundhouse website is all about the coffee. Read their comprehensive menu, which features everything from “Brewed Coffee (it is what it is)”, to “Carmelicious (Shots of espresso, steamed milk, caramel sauce, whipped cream and caramel drizzle)”. With sixteen coffee-related drinks, there’s something for everyone. Yet they cared enough to get the iced tea right. See our empty iced tea cups? Seriously, I have to get better at setting up photos. Groundhouse is as urban cool inside as it is outside. 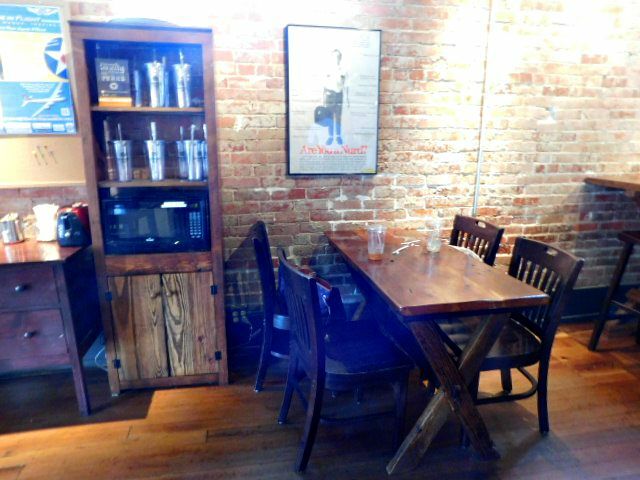 Red brick walls form the backdrop for an eclectic mix of art. 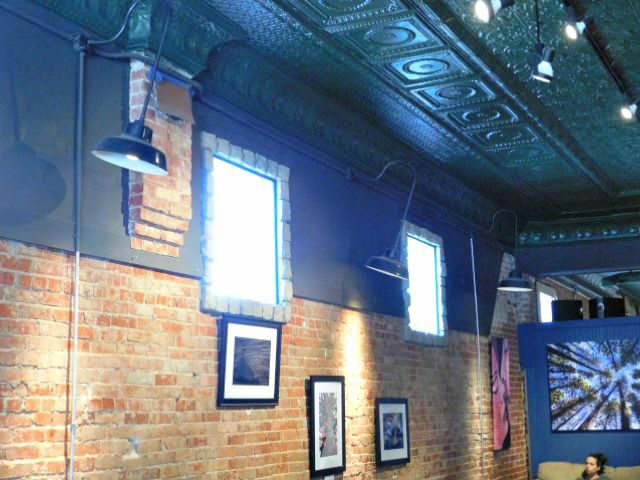 High windows draw the eye to the pressed tin ceiling two stories above. The effect might be sterile if it weren’t for the solid, comfortable furniture that invites guests to make themselves at home. The friendly barista, who knew many customers by name, helped too. No, I don’t know who was sitting there. I was too shy to ask, but not too shy to take a picture of her arms. Friendly barista, solid furniture. I could go back. High windows shed plenty of light. 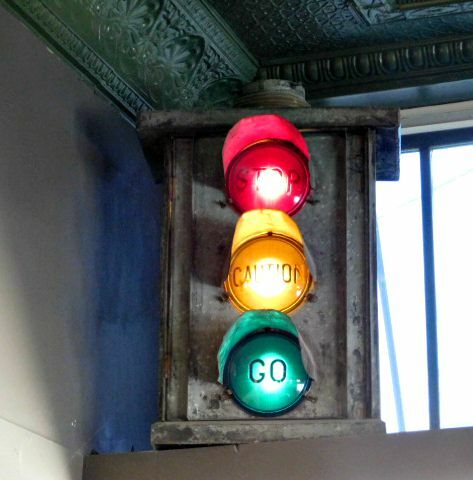 This vintage stoplight connected me with a scene in Lottie’s Gift. I’ll say more about that as the release date nears. When the tea was gone we took a little drive, and Mom pointed out the Johnson County Fairgrounds at the end of the next block. As kids, my folks were 4-H club members in rural Indiana, and have a lifelong interest in the annual local and state fair. 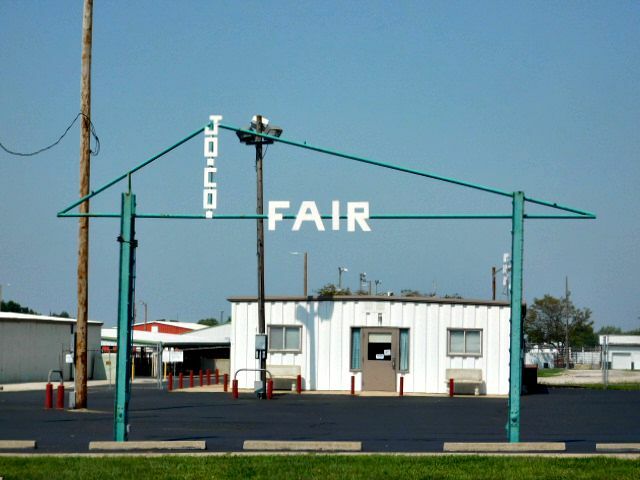 The fair is long over, but I like its mid-century-modern sign. I would love to! At some point I’d like to talk with you about how to set up book signings. I hope yours goes well on Saturday, by the way.